When I spoke with Lily Allen, it was evident that she had a lot to say. Her words were short, but her ideas were drawn out – she elaborated on opinions with a tone of voice rather than a gathering of syllables. She validated her own thoughts much before our conversation, and evidently, far prior to releasing her latest album Sheezus. The record, a very direct [and arguably, very accurate] social commentary succeeds in typical Allen fashion. Acting as a pop culture muckraker of sorts, the singer gets to the truth with help from a bit of wit and a lot of honesty. But don’t take her word for it – she wants you to figure it out for yourself. Allen takes a moment to reflect on the recent run of performances supporting superstar Miley Cyrus’ Bangerz tour. “You know, it was kind-of crazy because I’ve never supported anyone before, in my life. And I think with this album cycle, I really tried to push boundaries for myself,” she comments, “I’ve really really worked quite hard at developing my life, so I feel like taking that on and doing an arena tour for people that have no idea who I am was really beneficial in a lot of ways.” Despite not having her full band, Allen considers the reception to have been beyond expectation. “It was crazy! I was kind-of expecting it to be like, you know, the first three rows [filled], but it wasn’t. It was full every night. The response was incredible for what it was.” She also credits Cyrus for a successful production, declaring that being behind the scenes was equally as amazing as being on the stage. 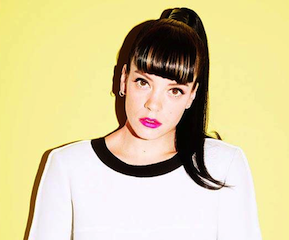 Dates and ticket information for Lily Allen's current North American tour can be found here.